Data can be a potent form of empathy. So, when we saw that 47% of Americans couldn’t come up with $400 in savings in an emergency, we saw an opportunity to help solve a cultural problem. We put design thinking into action. We dug deeper to find that financial concerns were driving record levels of distrust, isolation, pressure, uncertainty and stress. And because Frost Bank was built on making people’s lives better, we believed they’d be at their best in the eye of this cultural storm. Improve the financial well-being of Americans. We talked to people, read up on neuroeconomics, asked experts, covered posted walls with Post-It notes and ideated together. Through research we identified a powerful tool that can make a major impact on financial well-being: Optimism. But, how does a bank (a bank of all things) inspire optimism? We grounded our message in research, focused on key areas, and aimed to start a movement, not an advertising campaign. Of course, this doesn’t happen overnight. So, this is just the first stages of a multi-year effort. To foster generosity, we created Frost It Forward debit cards, loaded with $20 and instructions to make a stranger’s day better. 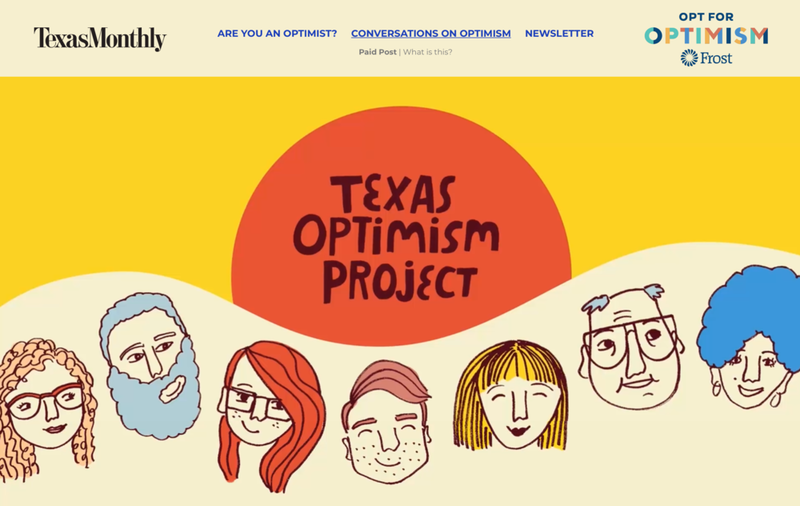 We partnered CultureMap to hand out the cards across Texas and tracked the spread of optimism on Instagram. The 30-Day Optimism Challenge was designed to build a sense of optimism every day in small, incremental steps. The challenge included an influencer campaign, daily emails and a Facebook group. 290,000 acts of optimism were completed by people around the country. 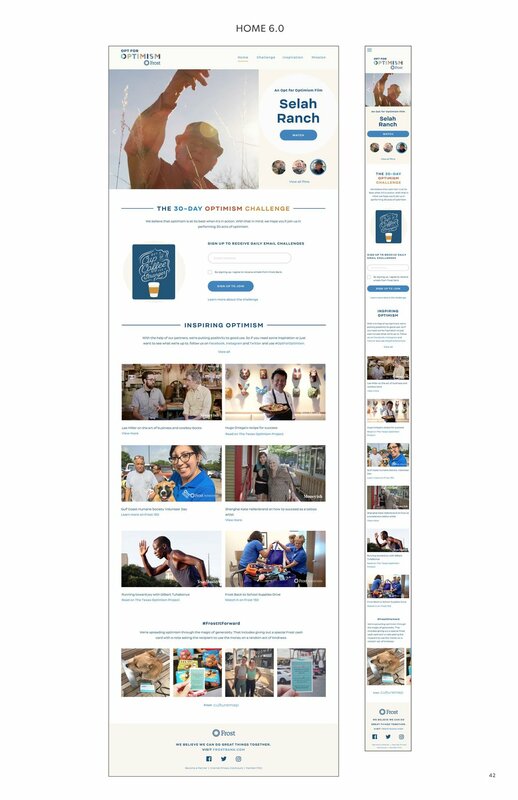 Here are the first six iterations of the home page as we’ve added partner content, new initiatives and other media as they launch. Here’s a close-up of one of the latest pages, where we explain the mission of the campaign as well as proprietary research on the impact of optimism on personal finances. Here are a few examples of a newsletter, emails and confirmation screen related to the campaign. I also develop the content strategy and write the newsletter each month.